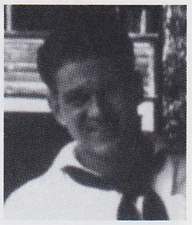 Johnnie Frederick Egner, Machinist Mate 1/c, born Dec. 17, 1918, Olmstead, IL, completed high school and joined the USN in September 1940. Military stations were the USS West Virginia and the USS San Francisco. He went aboard the USS West Virginia at Bremerton, WA, in November 1940 and was assigned to M Div. in the engine room as a fireman 2/c. He was also on the engineers rowing team. December 7, 1941, was an unforgettable day. He was serving in the USS West Virginia and was getting cleaned up to visit a friend at Schofield Barracks when he heard the first loud explosion. Discharged in October 1946 with the rank of machinist mate 1/c. He was awarded the Presidential Unit Citation and the Pearl Harbor Pin. Married Helene Elsa Jackson on Dec. 31, 1944, and lives in Fremont, CA. They have one child and three grandchildren. He was a service manager for equipment. He enjoys fishing.